Schott Zwiesel, the famed German producer of The Best Crystal Glassware has been a leader in innovation, style and technology for more than 100 years. Schott Zwiesel created Tritan® Crystal in 2001 by adding titanium oxide and zirconium oxide to develop "The World's Best Crystal Glass". Tritan® Crystal is 100% dishwasher safe-it will not etch, cloud or discolor for the life of the glass. Tritan® resists the damages of daily use-breakage, chipping and scratching. Tritan® is thermal shock resistant. Tritan® is one of the most clear and brilliant crystal, capable of conducting, refracting and transferring light more than any other crystal. Tritan® tempers the rim, the bowl and stem joint and the foot edge for added strength against chipping and breakage. All crystal items manufactured by Schott Zwiesel are cut with our patented laser technology for a smooth thin, elegant edge. Charles Schumann, proprietor of Munich's legendary Schumann's bar and author of the international classic "American Bar", first published in 1984, has set standards for decades. The basic bar selection line consists of tried and tested classics for the bar and also offers, with regard to its interplay of function and design, new sizes and accessories. The fifteen part Basic Bar Selection by Charles Schumann has been designed so that each glass highlights the specific character of the drink that's poured into and sipped from it. The Basic Bar Selection is manufactured in Tritan crystal glass, which sets new standards for brilliance, resistance to breakage, and dishwasher safety. 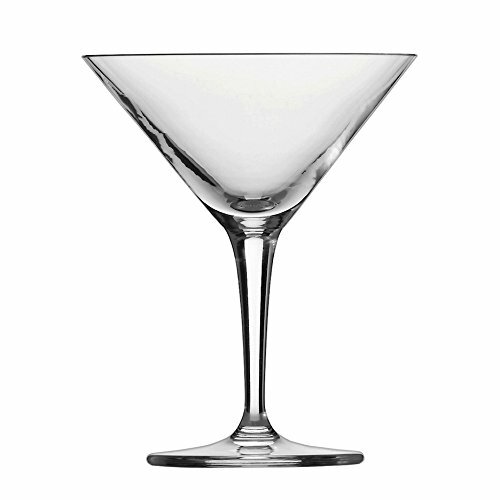 The Basic Bar by Charles Schumann traditional martini glass style is well suited for all martini style drinks . It features an 6.1 ounce capacityand measures 5.1 inches tall by 4.3 inches wide. Made in Germany, it is dishwasher safe.